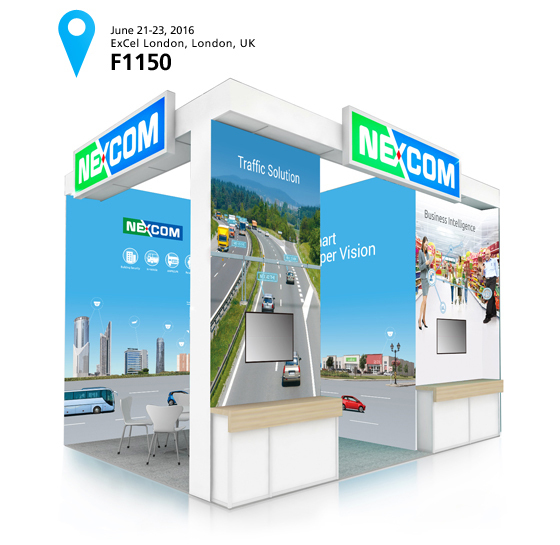 To grasp the most sophisticated technologies in intelligent security surveillance, please make sure to visit NEXCOM at booth F1150 at IFSEC 2016 taking place at the ExCel London exhibition center in London, UK on 21st to 23rd June. NEXCOM will showcase applications in business intelligence and mobile surveillance, as well as the latest in H.265 technology. In business intelligence (BI) application, NEXCOM will present up-to-date BIC-251 3D time-of-flight (TOF) camera and NCi-311-R 3 megapixel IP camera which can both capture clear image under any environmental illumination. NEXCOM’s BIC-251 3D TOF camera is able to calculate distance using infrared rays reflected from objects with TOF sensor, offering retailers images with accurate and precise data for various intelligent applications; for instance, people counting and in-store traffic analytics. On the other hand, NCi-311-R 3 megapixel IP camera features digital WDR, allowing it to capture true-color images at the store entrance where light gets into the store easily, causing overexposed images. NEXCOM also leverages the 8-CH PoE NVR MVS 5210 in business intelligence application for its multitasking capability such as running video analytics software like people counting continuously while recording real-time videos. NEXCOM offers several H.265 cameras featuring Sony's STARVIS sensor technology. For example, NEXCOM's HEVC/H.265 6 megapixel IP camera NCr-661-VHA is capable of delivering 4K video smoothly with lower bandwidth utilization by using the H.265 codec. Equipped with 6MP Sony STARVIS progressive scan CMOS sensor, NCr-661-VHA brings enhanced ultra-low light and adaptive IR functionalities to ensure clear image in light, dark, or even high contrast areas, making it ideal for security surveillance. There will be a demonstration of NCr-661-VHA capturing and transmitting real-time images to the NVR NViS 5604-i7 for storage and playback. The NVR NViS 5604-i7 is equipped with 4th generation Intel® Core™ processor and supports up to 16GB DDR3 1333/1600MHz memory. In addition, NViS 5604-i7 enables high quality digital recording, real-time display and supports a wide range of megapixel IP cameras. For mobile surveillance application, NEXCOM will introduce IFSEC visitors with NCm-301-V mobile IP camera, which supports image stabilization and offers high-performance 3 megapixel image quality. With True WDR, NCm-301-V can overcome various light conditions and deliver clear image output, making it perfect for license plate recognition application. Moreover, NCm-301-V is dedicated to transportation surveillance with EN50155 certification and a compact, IP67-certified housing. Cordially invite you to visit NEXCOM at IFSEC to discover groundbreaking technologies and applications.